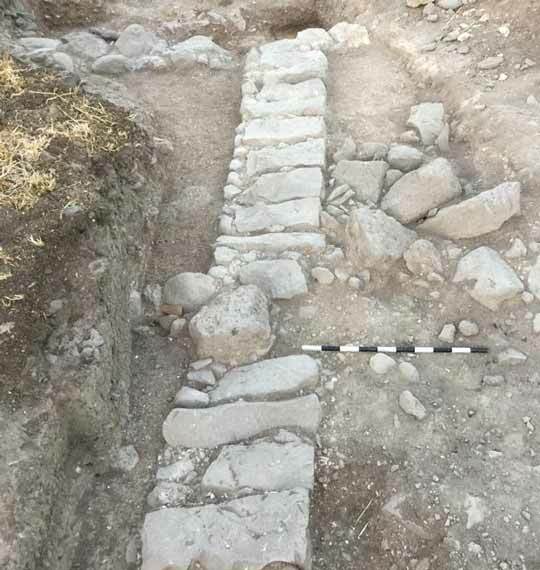 In November 2016, a salvage excavation was conducted along the outskirts of the site of Afiq in the southern Golan Heights (Permit No. A-7844; map ref. 265924–6174/742111–226), prior to installing a water pipeline. The excavation, undertaken on behalf of the Israel Antiquities Authority and financed by the Mei Golan Association, was directed by R. Assis (field photography), with the assistance of Y. Yaʽaqobi (administration), R. Liran (surveying and drafting), I. Delerson (plans), H. Tahan-Rosen (pottery drawing), E.J. Stern and M. Eisbend (pottery consultation) and R. Kool (numismatics). Laborers from Tiberias and the Golan, as well as a group of students from the Maʽaseh Be-Galil pre-army program participated in the excavation. Upon completion of the field work, the site was covered except for the excavation squares where a water pipe was installed. The Afiq site was surveyed in the past (Hartal and Ben Efraim 2012: Site 95) and was identified as an Arab village. Many architectural elements were found in secondary use in the walls of the village’s buildings. Dozens of such basalt items—column drums, olive press beds, door jambs, column capitals, column bases and cornice stones—were discovered during an archaeological inspection; they were subsequently transferred to the Qazrin museum. 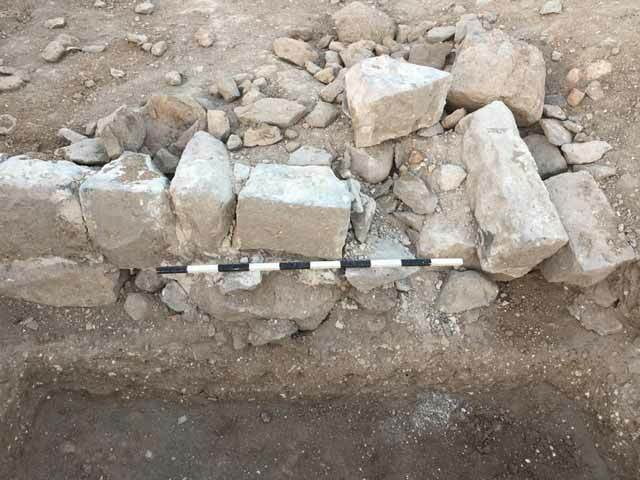 Several archaeological excavations were conducted in the immediate vicinity of the current the excavation: habitation levels from the Ottoman period were exposed some 40 m north of the site, above an industrial mosaic floor of a Byzantine-period agricultural installation (A. Efron, pers. comm. ; Fig. 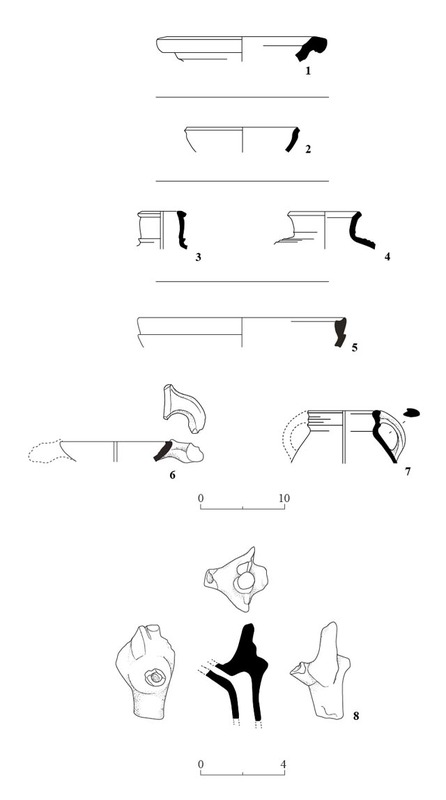 1: A-7740); remains of buildings from the Mamluk and Ottoman periods and an ancient Greek inscription incorporated in secondary use in a building were exposed c. 70 m to the north (Assis 2015; Fig. 1: A-7011); an olive press ascribed to the Byzantine period was exposed c. 100 m to the north (Kastenbaum 1984; Fig. 1: K-13/1982); and remains of a Byzantine-period building, as well as potsherds from the Abbasid and Mamluk periods, were revealed c. 200 m to the northeast (Zingboym 2009; Fig. 1: A-4957). 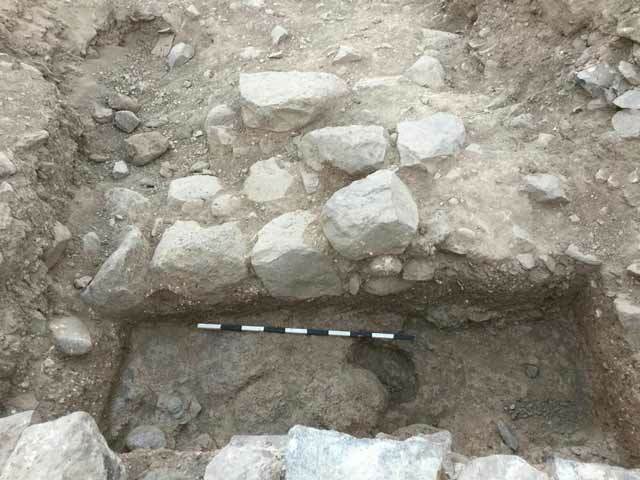 In the current excavation, remains of the Syrian village of Fiq were located on the surface (c. 5 × 50 m) and were removed by means of mechanical equipment (depth c. 0.6 m). Since a communications infrastructure cut through the ancient remains in the western part of the site, the excavation was carried out in the eastern part of the area (c. 4 × 25 m; Fig. 2), where Highway 98 intersects with the road leading to ʽEn Fiq. The excavation revealed settlement remains from three periods (I–III): Umayyad (661–750 CE), early Ottoman (sixteenth–seventeenth centuries CE) and late Ottoman to the present (eighteenth–twentieth centuries CE). Umayyad Period (Stratum III). The foundations of three walls (W105, W108, W109) were exposed beneath the collapsed stones of Stratum II, which covered the entire excavation area (L101, below). Walls 105 and 108 were built of dry construction, utilizing basalt fieldstones of various sizes. Wall 109, also built of dry construction, consisted of two rows of basalt stones, with smaller stones in between. The unsmooth bedrock revealed beneath the walls was characterized by hollows, which prior to the construction of the walls were filled with basalt fragments mixed with soil and pottery sherds (Fig. 3); thus, the walls were founded on leveled surface. Umayyad-period sherds were found between the stones of the walls and near the walls. It seems that after the area was abandoned, the walls collapsed, and the foundations were all that remained of them. Early Ottoman Period (Stratum II). After years in which this part of the site remained in ruins, the collapse in the strip between W108 and W109 was partially removed. The debris were crudely leveled, and smaller stones were inserted between the larger ones to clear a straight, north–south road between the ruins (L111; Fig. 4). The construction of this road was dated to the beginning of the Ottoman period based on sherds found between the paving stones. Late Ottoman Period to the Present (Stratum I). This stratum contained a mixture of pottery sherds ranging in date from the Hellenistic to the Ottoman periods, and the remains of two construction phases. Two walls (W103, W104) were built in the first phase. All that survived of W104 was a foundation of basalt stones arranged as headers and stretchers, which abuts W105 of Stratum III (Fig. 5). A foundation built of roughly hewn basalt stones and a single course constructed of basalt stones, whose outer face was well dressed, were the only remnants of W103 (Fig. 6). Thin-grained white bonding material, which is characteristic of the late Ottoman period, was preserved in both walls. Their construction appears as a jumbled mass, from which the ruins of the previous periods had not been properly removed. Both walls had collapsed. Among the collapsed stones adjacent to W104 (L101) was a small, early eighteenth-century silver Ottoman coin (Table 1:7). In the second phase, during the time of the French mandate and the Syrian rule, the debris were largely cleared, and a soling road with asphalt was paved, which survives to this day (Fig. 7). A large stone, originally a olive-press press-bed, was incorporated in secondary use in the road (Fig. 8). In 1968, the village was demolished and the collapsed stones were spread over the surface (L100). Seven coins (Table 1:1–6, 8) were discovered in close proximity to each other (up to 0.5 m apart) within the surface layer in the eastern part of the area. Of these, six were identified: one from the Byzantine period (Table 1:1); three from the Umayyad period (Table 1:2–4); and two from the Ayyubid period (Table 1:5, 6). Pottery. Most of the pottery, except for that found in Stratum III, was discovered in mixed loci. 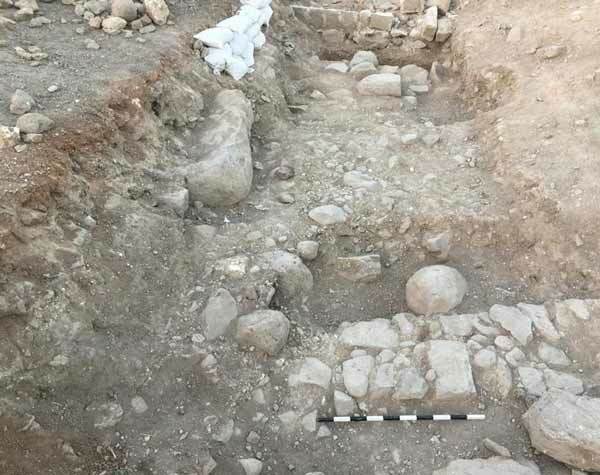 As the finds represent the periods when the site was inhabited, they are of great significance since so little research has been done to date on the Golan Heights during the Early Islamic period. The pottery sherds date from the Hellenistic period to the Ottoman period. They included a basin (Fig. 9:1) from the Hellenistic period; a bowl (Fig. 9:2) from the Roman period; jars (Fig. 9:3, 4) from the Byzantine period; an imported mortarium (Fig. 9:5), a frying pan (Fig. 9:6), a cooking pot (Fig. 9:7) and a spout of a zoomorphic vessel (Fig. 9:8) from the Umayyad period; a glazed bowl (Fig. 10:1) and a juglet (Fig. 10:2) from the Abbasid period; a locally produced glazed bowl (Fig. 10:3), an imported glazed bowl (Fig. 10:4) and a cooking pot (Fig. 10:5) from the Ayyubid period; a glazed bowl (Fig. 10:6) and a glazed cooking pot (Fig. 10:7) from the Mamluk period; and a tobacco pipe (Fig. 12) from the Ottoman period. With the decline of Hippos (Sussita) in the Byzantine period, Afiq’s star ascended, and it continued to grow in the Umayyad period (Hartal 2012: Section 4:15). 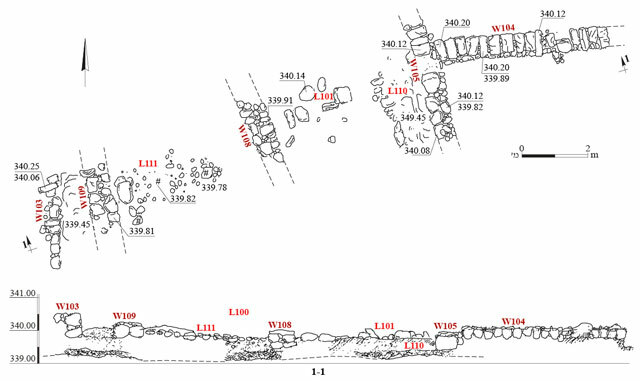 This conclusion is consistent with the finds in the field, which indicate that during the Umayyad period the boundaries of Afiq had expanded, and new buildings were constructed in places that were previously uninhabited. This expansion stands in contrast to many contemporary settlements in the Golan Heights during this time. The population of Afiq apparently increased during the Umayyad period, after darb el-Hawarna, the road from the Hauran to ‘Akko, which was built by ʽAbd al-Malik, circumvented Sussita and passed through Afiq; this established the status of Afiq as the main settlement in the southern Golan Heights. Despite the limited scope of the excavation and the paucity of the ceramic assemblage, the finds are sufficiently significant to suggest that the site was continuously inhabited beginning in the Hellenistic period, had reached the peak of its development in the Umayyad period and declined in the Abbasid period. Even though there was an increase in the quantity of pottery sherds between the Ayyubid and Mamluk periods, it seems that the site did not return to its peak size during the later period. A decrease in the quantity of sherds between the Mamluk and the Ottoman periods is evident. The finds from the Ayyubid period are surprising, because it was commonly accepted that the Golan was abandoned during this period. 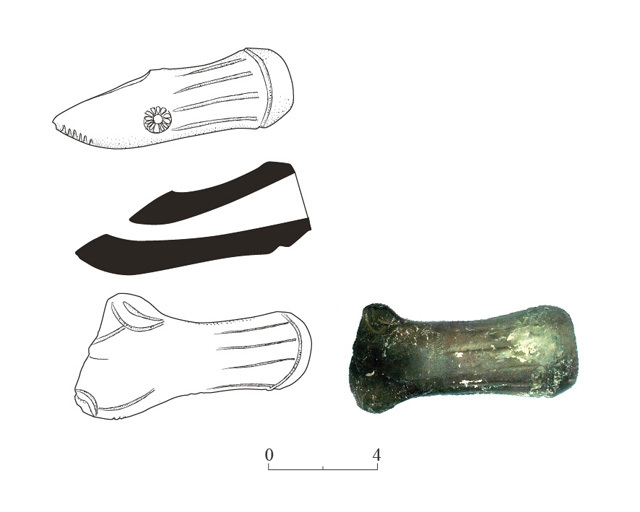 The mortarium fragment that was found from this period (Fig. 9:5) belonged to a vessel that had been imported from the Aegean region and reached the site by way of trade routes from the port in ʽAkko. This is important evidence, because in the Ayyubid period the Golan was a buffer zone between the Crusader kingdom and Damascus; it seems that trade relations between the two continued during the Ayyubid period (Hartal 2012: Section 4:16). The two bronze coins from the Ayyubid period, which came from unsealed assemblages, provide further confirmation, albeit circumstantial, that the site was inhabited during this period. The Turkish tax lists of 1596 CE reflect the decline of the settlement in the Ottoman period: only 23 villages are reported in the southern Golan, and Fiq (Afik) was one of them. During this period, merely 964 peasants lived in all of the villages of the southern Golan, whereas the central Golan was inhabited by 10,603 Bedouins and Turkmans and 304 peasants (Hartal 2012: Section 9.11.3). 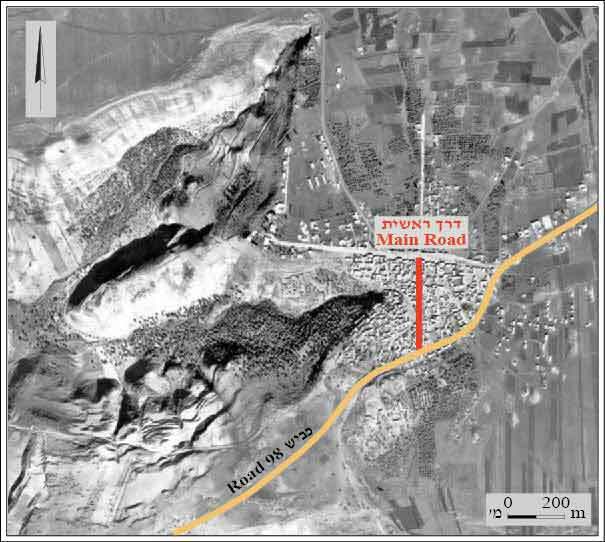 Further evidence of this settlement decline is found in the haphazardly manner by which Road 111 was paved: directly on top of collapsed debris, without removing them beforehand. The paving method fits a situation whereby the roads were not built by the state, but rather by local residents, who engaged in this work with minimal investment. Burckhardt, Guérin and Schumacher, who surveyed the site in the nineteenth and twentieth centuries CE, described the villagers as living in tumbledown ruins. The abandonment of the area continued until the end of the Ottoman period, when the government tightened its control over the area and brought in a Circassian population (Hartal 2012: Section 9.11). The press bed used for extracting olive oil by means of direct pressure can be added to other press beds and stone weights discovered during inspection at the site. 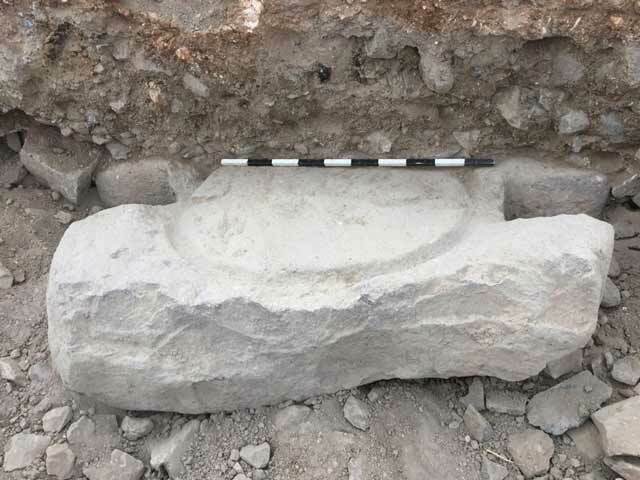 It seems that an olive oil industry operated for a long period of time at Afiq, utilizing a variety of methods; the olive press that was excavated in 1982 (Kastenbaum 1984) is one of many examples. Assis R. 2015. Afiq. HA-ESI 127. Hartal M. 2012. Survey of the Golan (Archaeological Survey of Israel). Hartal M. and Ben Efraim Y. 2012. 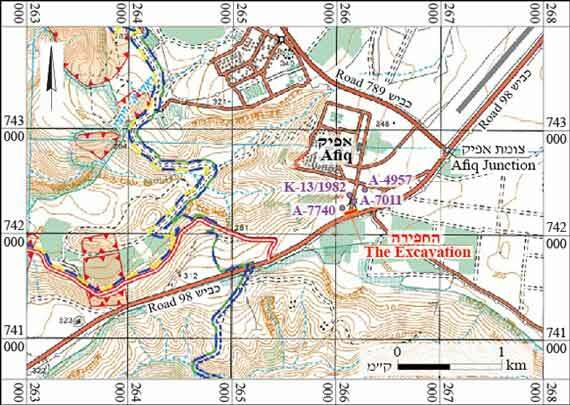 Map of ‘Ein Gev (40) (Archaeological Survey of Israel). Kastenbaum H. 1984. Fiq. ESI 2:32–33. Zingboym O. 2009. Afiq. HA-ESI 121. 3. The bedrock west of W109, looking east. 4. The stones of Road 111 between W108 and W109, looking west. 5. Wall 104 and collapsed stones (L101) to its north, looking west. 6. Wall 103, looking west. 7. Aerial photograph of the Syrian village of Fiq from 1966 (Hartal and Ben Efraim 2012: Site 95). 8. The press bed, looking south. 9. Pottery from the Hellenistic, Roman, Byzantine and Umayyad periods. 10. Pottery from the Abbasid, Ayyubid and Mamluk periods. 11. A clay pipe from the Ottoman period (L100, B1011/3).